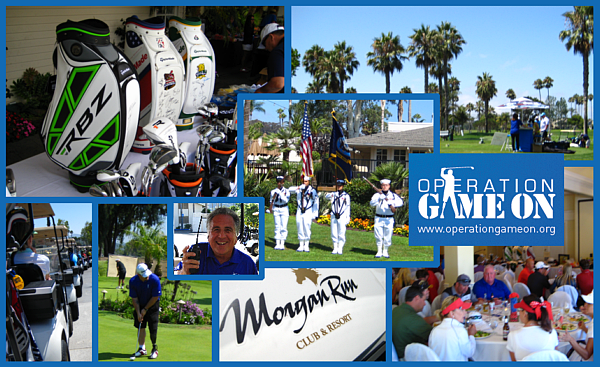 The troops are able to go through the OGO golf program and achieve a higher level of rehab than might have been capable otherwise. If you have any doubt, just try to play golf with an ordinary injury or headache and you’ll see quickly how difficult the game can be. The troops often times are dealing with multiple amputations and bomb blast wounds that restrict movement and or balance. Golf helps them learn how to overcome these challenges while having a whole lot of outdoor fun at the same time. That’s why we sometimes shout, “IT’S GAME ON”, around here at Operation Game On! If you missed this special chance to tee it up with us at this event and donate to this great cause, you can donate today online or feel free to contact us and discuss a special one-time donation. Take a moment to view this tournament’s PHOTO GALLERY and you’ll see why our good friend Mark Dastrup is a professional commercial photographer in high demand here in San Diego. Thanks Mark!